Are you looking to create more space or simply want to enjoy your garden view all year round, our energy saving conservatories are proven to reduce your carbon footprint and give you significant savings on your fuel bills. Our aim is always to deliver the best style or solution to suit your home. We offer a free consultation and quotation on all conservatory installations and a full 10 year insurance backed guarantee. A conservatory is probably the most versatile extension you could choose for your home. It gives you more light, much more useful space and of course adds value to your home. It is also going to give you many years of service, so it’s important to choose carefully…to choose the style, size and location but, most important, to choose a company you can trust to work to the highest professional standards and give you guarantees that won’t let you down. 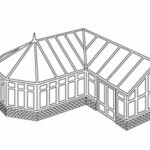 At Double Glazing Direct , we start every conservatory project at first principles. We begin with a survey, then discuss how to turn your idea into reality with expert planning and design before moving on to the installation, where we employ only skilled installers and subcontractor. We will not only design to please the eye but also advise on practical details such as ventilation, heating, electricals and choice of glazing options. Just as with our windows, you can choose from a whole range of designs in white, Rosewood & Golden Oak either on both sides or with white on the inside. We also offer a Range of colours which include Black, Green, Grey & Ivory which is complemented with a matching Conservatory roof. Why choose a Double Glazing Direct conservatory? 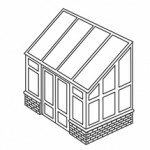 Whether you are looking to extend your living space or searching for a cost effective way to increase the value of your home, our tailor-made uPVC conservatory designs, all offering both space and value, provide an almost limitless range from which you can choose the perfect addition to your home. 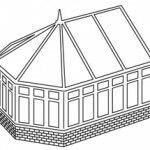 You can select from the 4 main conservatory styles and then see how it meet your needs and complement your home. Combining traditional and contemporary designs with the most up-to-date UPVC conservatory manufacturing and construction techniques, we ensure that with all our conservatories you will have a low maintenance extension that you and your family will enjoy all year round. With a 10 year guarantee on all our uPVC conservatories, you will be safe in the knowledge that your conservatory is built to last. 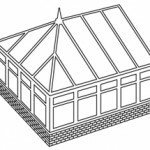 Not only will your new conservatory be manufactured and built to match your requirements exactly, but we will also ensure that security always comes first by meeting and exceeding the BS6399 requirements to withstand the British weather and providing multi-point locking systems and extra strong wall frames as standard to deter even the more determined criminal. From survey and design, through conservatory planning, to building and quality control – we manage the whole process from start to finish leaving you to enjoy your new conservatory. Get in touch today and join our multitude of happy customers across the Aylesbury Vale and Buckinghamshire who have already trusted us with their home improvement projects such as the installation of conservatories and double glazed windows.